One of the basic indicators of ethno-cultural integration is residency: where do different ethnic groups live? Do they cluster in different areas or do we find areas becoming more mixed? The evidence suggests the answer is both. Who is moving and why? Residential areas in England and Wales are becoming somewhat more ethnically mixed over time. 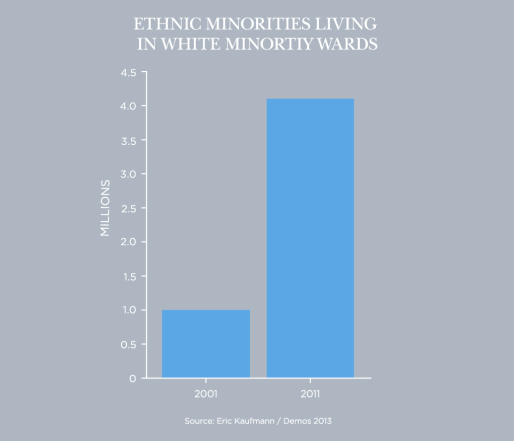 Minority populations are generally growing and spreading out but some groups – Pakistanis, Bangladeshis and some Black Africans – tend to live in noticeable residential clusters in cities like London or Birmingham. You can explore this by looking at our interactive ethnic-residency map, which shows the ethnic mix of people by wards in England and Wales in 1991, 2001 and 2011. The index of dissimilarity, the main measurement of mixing or lack of it, shows that there is more mixing among all ethnic groups but not between minorities considered as a whole and White British. You can explore the index of dissimilarity at ward level between 2001 and 2011 in England and Wales here. Between 2001 and 2011 across England and Wales, urban places (wards and local authorities) with the largest increases in ethnic minority populations also had the greatest losses of the White British population. London’s population increased by 1 million between 2001 and 2011, and around 620,000 White British moved outside the M25 (−14 per cent). Analysis by Kaufmann and Harris found that whites preferred to move to whiter areas where there are fewer minorities, often outside London. This does not necessarily mean they deliberately wanted to avoid or felt hostile towards minorities but rather they were attracted to the familiar. You can explore these trends at ward level between 1991 and 2011 in our interactive map of England and Wales. To understand where minority Britons live we need some history. 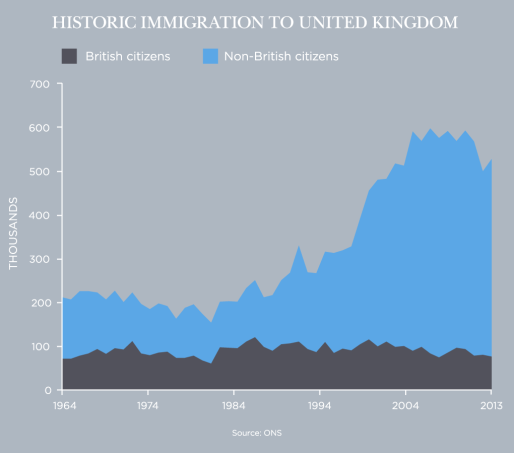 Postwar immigration to the UK has happened in two main phases. The first, post-colonial, phase was from 1948 until the early 1990s, the second phase began in 1997 and continues to this day. The main flows in the first phase were from the Caribbean, the Indian subcontinent and Africa (with continuing flows from Ireland too). Roughly 2 million people arrived in that period and had roughly 2 million children, giving an ethnic minority population of 4 million or around 7 per cent in the mid-1990s. In the second phase, from 1997 to the present, the annual rate of non-British inflow has been two to three times higher than in the first phase – and the ethnic minority population (including white minorities) in England and Wales has nearly trebled to more than 11 million or over 20 per cent of the population (see also our discussion of ethnic categories). 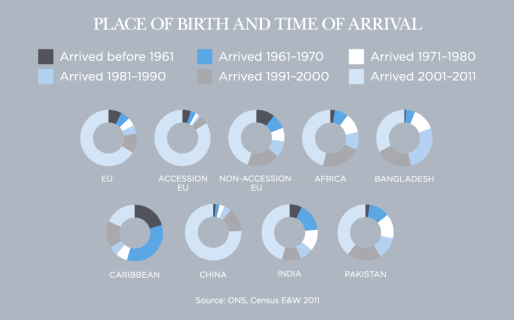 In the mid-1990s only about 40 per cent of Britain’s ethnic minority population was born abroad; because of the scale of recent immigration that figure is now around 60 per cent. As of December 2016, net migration is estimated to be 248,000 (immigration 588,000, emigration 339,000). This is an decrease of 84,000 from 2015. Of those coming in, 43 per cent came from within the EU, 45 per cent from outside of it, while the remainder were returning Britons (13 per cent). 275,000 people came for work in 2016; decrease of 19,000 on the previous year. Two thirds of these had a definite job offer while the remainder were coming to look for work. The numbers coming to take up a job have remained constant in recent years while those coming to look for work have been falling – down by 35,000 on the year before. The numbers coming for reasons of family reunification stands at 85,000. These numbers have been fluctuating in more recent years but are up from 62,000 in 2012. Those coming to study stand at 136,000, down from 136,000 on the year before. Britain has no long-standing or indigenous minorities (unlike North America) but for hundreds of years there have been small minority communities (mainly Irish and Jewish, with some African and Indian) in several big cities and port towns like London, Liverpool and Cardiff. When the post-colonial wave began in 1948 most of the early arrivals had little money and ended up in private rented accommodation in slum clearance areas or in those traditionally immigrant quarters. They settled where they could find work or where friends and family were already settled. Those who had fought in the war sometimes returned to where their camp had been: the Caribbean community in Nottingham, for example, is partly the result of the Caribbean presence in the military camp there during the war. Most immigrants clustered together in minority ethnic enclaves partly out of choice and self-protection, and partly because that is what the British authorities (including estate agents) encouraged. Social housing was not generally open to immigrants until the late 1960s and early 1970s. By then many Indians and Pakistanis had bought their own homes, while Caribbeans, Africans and Bangladeshis became more concentrated in social housing, the Bangladeshis in the east end of London (some time later in the 1980s). Pakistanis tended to settle in Birmingham and the northern mill towns. Indians settled in west London, and in Slough, Leicester, Birmingham, and Wolverhampton. Caribbeans were centred on south London with significant settlements in Birmingham, Bristol, Leeds and Manchester. Africans were mainly London-based. All these groups had strong previous ties with Britain through the empire (later New Commonwealth) and had open access to the country, at least from 1948 to 1962, and automatic citizenship. The second major phase of immigration starting in 1997 has not been, as is often believed, dominated by the East Europeans who began arriving in 2004 after their countries joined the European Union. About 1.3 million East Europeans claimed national insurance numbers in Britain between 2004 and 2009 and there are about 1.1 million currently resident in Britain, but only around a third of net immigration since 1997 has been from the EU (even less permanent settlement). The majority of second wave immigrants have continued to come from developing countries. Many have come, as in the first phase, from the New Commonwealth countries in Africa and Asia but they have been supplemented by people from places likes Somalia, Afghanistan and Zimbabwe. This was a result of a rise in those seeking asylum plus easier international travel and relatively relaxed immigration rules after 1997, which drew people from a wider range of countries to Britain’s booming economy. The second wave immigrants often started their lives in Britain in the places of first wave settlement, but their arrival also sped up the process of ethnic minority dispersal, which was already well under way, into more suburban settings. Outer London boroughs like Redbridge and Merton, which had been overwhelmingly White British in the mid-1980s, became increasingly mixed. East Europeans settled in established centres of immigration like London, Slough and Bradford, but also spread out into areas unused to substantial inflows such as East Anglia and Lincolnshire. In recent years net immigration has been running at around 200,000 to 250,000 a year and permanent settlement at 150,000 to 200,000 a year. In the second phase of postwar immigration there has been a higher level of short term immigration, boosted by free movement from poorer EU countries after 2004 and the increase in student migration. But a large majority of those granted permanent residence continue to come from outside Europe. Between 2007 and 2013 there were roughly 1.2 million people from outside the EU granted the right to remain here. The main migration routes – both permanent and temporary – are work, study, family reunion and asylum. Of those granted permanent residency between 2007 and 2013, 39.2 per cent came for work related reasons, 6.1 per cent came for asylum, and 35.3 per cent came for family formation and reunions. It is estimated that roughly 15 per cent of migrants who were issued student visas in 2007 have after five years found ways to stay on legally or have settled. Illegal immigrants are those who have not come through migration controls or have come here using false papers. The definition also includes those who have overstayed beyond a pre-defined time period and those who have had asylum applications refused but have remained. It also includes those children born here to couples with no legal right to reside here. Obviously it is hard to get numbers on illegal immigrants. One attempt by academics at the London School of Economics concluded that in 2007 there were between 417,000 and 863,000 illegal immigrants living in the United Kingdom. Many of these would be found in London where the same report estimated there were between 281,000 and 630,000 (note that these figures included children). 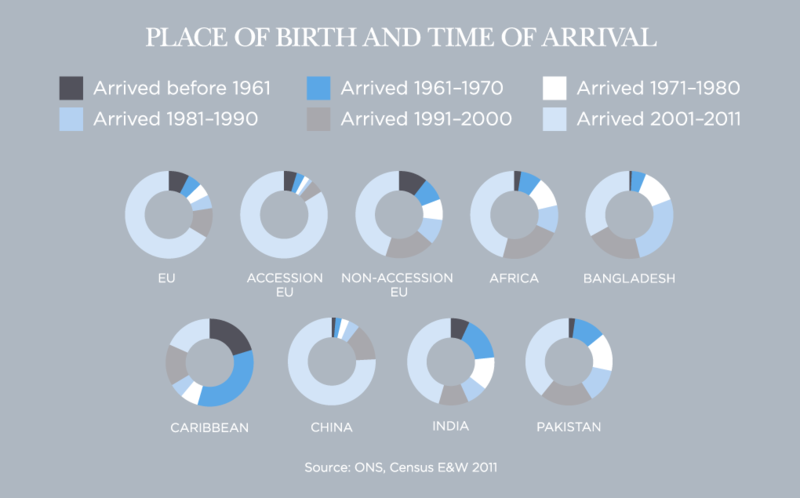 After the first post-colonial phase of immigration drew to a close in the early 1990s more than half of ethnic minority Britons were UK born. Following the latest wave of immigration, that number has fallen to around 40 per cent. 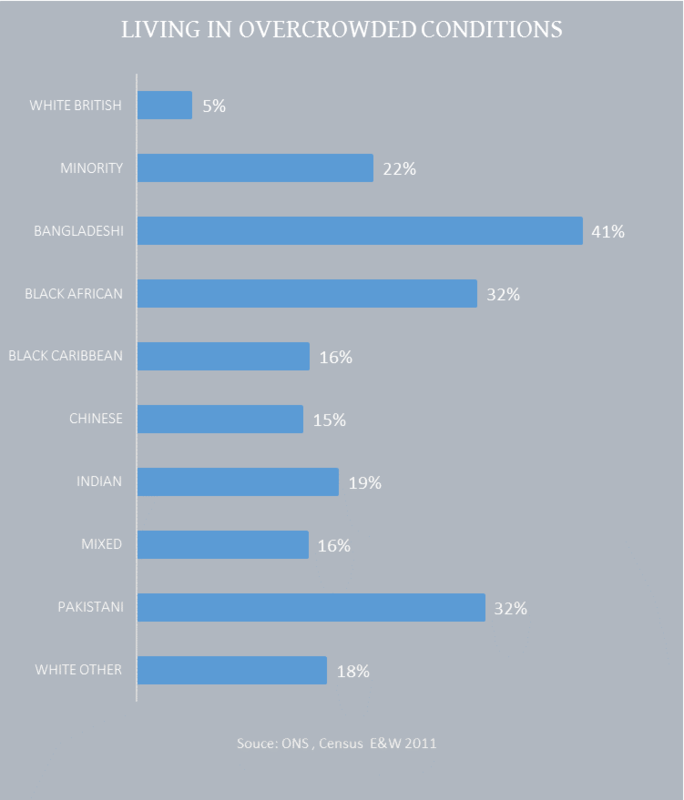 So who are ethnic minority Britons and where do they come from? Out of a total population of 56 million there were 45 million White British in 2011, according to the 2011 census for England and Wales. There were nearly 11 million ethnic minority people (including about 3 million white minorities). There were 1.4 million people of Indian background, 1.1 million Pakistanis, roughly 1 million Black Africans, almost 600,000 Black Caribbeans, 450,000 Bangladeshis and 400,000 Chinese. There were 1.2 million mixed ethnic people. Of other significant groups there were around 530,000 Irish, 95,000 Turks, 101,000 Somalis (also counted under Black Africans) and 676,000 Poles. Another large Eastern European group are Romanians, who number 83,000. Of Polish-born UK residents, 24 per cent live in London, and 54 per cent of Romanians live in London. Considering other commonly used categories there were 3.2 million people of South Asian descent, 2.7 million Muslims (nearly 5 per cent) and roughly 207,000 East African Asians. Unpacking the census’ White Other category, there were 561,000 West Europeans and around 1 million East Europeans resident in England and Wales plus 84,000 New Zealanders or Australians and 100,000 North Americans. In England alone in 2011 there were 10.7 million people from ethnic minorities or 20.2 per cent of the population, according to the 2011 census. The other countries in the UK had far lower numbers and proportions of ethnic minorities. In Scotland, there were 221,000 ethnic minorities (4.2 per cent) while in Wales there were 208,000 (6.8 per cent), and in Northern Ireland 32,000 (1.8 per cent). The population share of the White British accordingly varies across the country as illustrated below (note that darker shades denote a greater share of White British and fewer ethnic minorities). The census counts those who are normally resident in the country. But among ethnic minorities normally resident here there are two important further distinctions: those who are born here and thus almost always automatically citizens, and those who are immigrants (born abroad), some of whom will have become citizens and others who will just be legal residents. According to the census of England and Wales, in 2011 there were 7.5 million people who were born abroad while 3.4 million of these people held a UK passport (this being a common proxy for citizenship) – that amounts to 45.6 per cent. That leaves us with 4.1 million born abroad who do not have a UK passport. 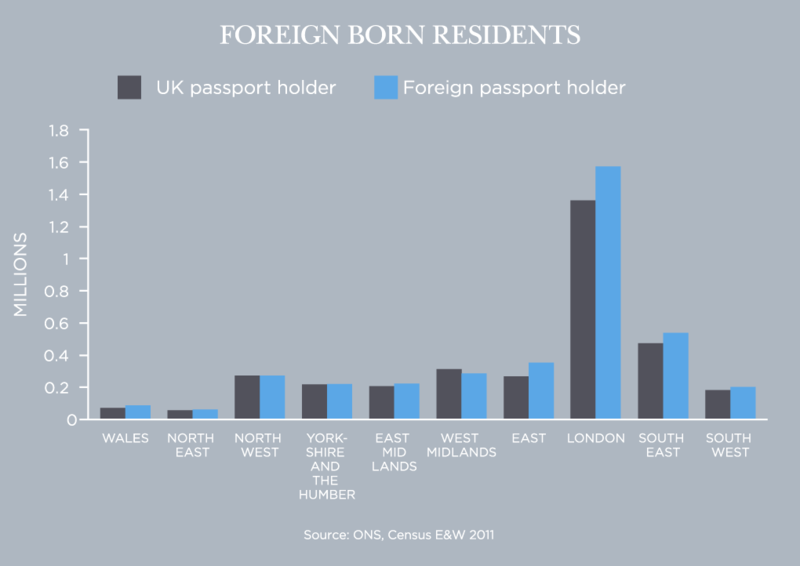 Most foreign-born people live in London and it is there where the highest number of people with a foreign passport are found. The 2011 census reveals there were 4.4 million ethnic minority individuals who had been born here. Again, they are mostly found in London although other regions show substantial populations. 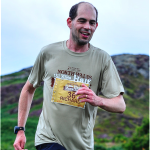 In Wales, the North East and South West, there are relatively few. 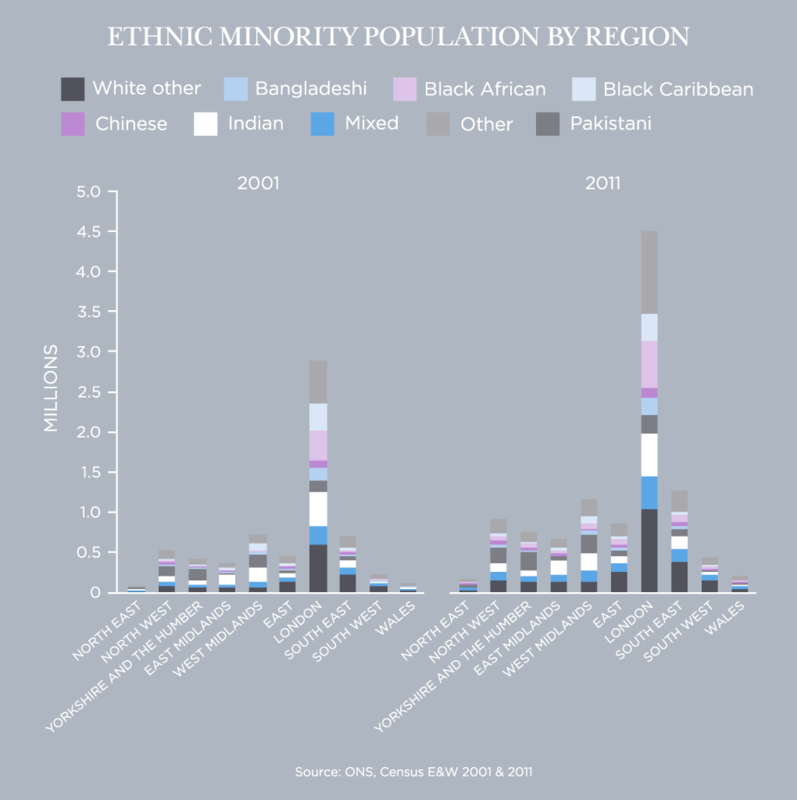 The geographic distribution of specific ethnic minority groups is further illustrated in the dashboard below. How does the aggregate figure of 40 per cent of the main minority groups born here and 60 per cent born abroad break down? Indians are close to that average, while Caribbeans and Pakistanis are the other way round, with around 60 per cent born here. Close to half of Bangladeshis were not born in the UK. This compares with about 85 per cent of the White Other group and 76 per cent of Chinese. Only a relatively small percentage (20 per cent) of mixed ethnicity people were born abroad. The top five countries of origin of those born abroad are India, Poland, Pakistan, the Republic of Ireland and Germany. Migrants have arrived from these countries at different stages. Migration from the Republic of Ireland came first – 38 per cent of Irish-born residents in 2011 had arrived before 1961. This compares with 86 per cent of Polish-born residents who had arrived in 2004 or later. Between 1951 and 2001, people born in Ireland were the largest group of people born abroad until 2011, when the number of Indians became larger. Some ethnic and religious groups have younger age profiles than others, and this must be taken into consideration when looking at their participation in the labour market and education. According to the 2011 census, the mean age of adults across all ethnic groups in England & Wales was 40; it was 42 for White British people compared with 31 for the ethnic minority population (including white minorities), and 29 for the non-white population. In the Asian/British Asian group Bangladeshis had the youngest mean age at 25 years, Pakistanis followed at 27 and Chinese at 32. Indians had a somewhat higher mean age at 34. Black Caribbeans, another long-established group, had a mean age of 39 while Black Africans and people from ‘Other Black’ backgrounds had mean ages of 28 and 26 respectively. Mixed white and Black African and white and Asian populations both had mean ages of 21 while mixed white and Black Caribbean had a slightly higher mean age of 22, perhaps reflecting the fact that a significant number of mixed-ethnic partnerships is a relatively recent development. White Others, including Eastern European migrants who had arrived from 2004 onward, had a mean age of 33. An increasing number of people are thought to be living what might be called ‘transnational lives’, meaning they are not fixed in any one particular country though may have citizenship or a right to residence in the UK. It is hard to get numbers but anecdotally nationals of many Eastern European countries, including Poland, along with India, Russia and Jamaica, are thought to be most often found in this group. Nineteenth century Britain was well known for accepting individual dissenters who were unwelcome in their own countries—from Marx to Mazzini. Larger groups of refugees of up to 100,000, though normally in the lower tens of thousands, have also been accepted at different times: Huguenots in the 17th century, Jews from Russia and Eastern Europe in the late 19th century and then again in the 1930s from Germany and other parts of Europe. The main post-war groups were: Poles, Hungarians, East African Asians, Greek Cypriots, Bosnians/Kosovans and Somalis. For much of the post-war period Britain was one of the main destinations for the relatively small number of refugees who were then on the move. Germany started to pull away in the mid-1980s as a result of inflows from the Iran-Iraq war and then the breakup of the Soviet Union, and the former Yugoslavia, though many of the incomers were people with German ancestry. The number of applications for asylum in the United Kingdom has fluctuated dramatically since 1979. Between 1979 and 1988, the number of applications (including dependents) was low with a yearly average of 4,250. Then, in 1989 there was large increase in the number of applications peaking in 1991 at 73,400. The number of applications troughed at 28,000 in 1993 but rose more or less uninterrupted thereafter, reaching a high of 103,081 in 2002, partly the result of conflict in the Balkans but also because many economic migrants used the asylum route into the country. Following government moves to tighten up on asylum applications (and easier access to legal immigration), the number then dropped and between 2003 and 2013 there has been a yearly average of 32,410 applications made by asylum seekers and their dependents. The number of accepted applications for asylum (including dependents) usually runs at about one third of actual applications. 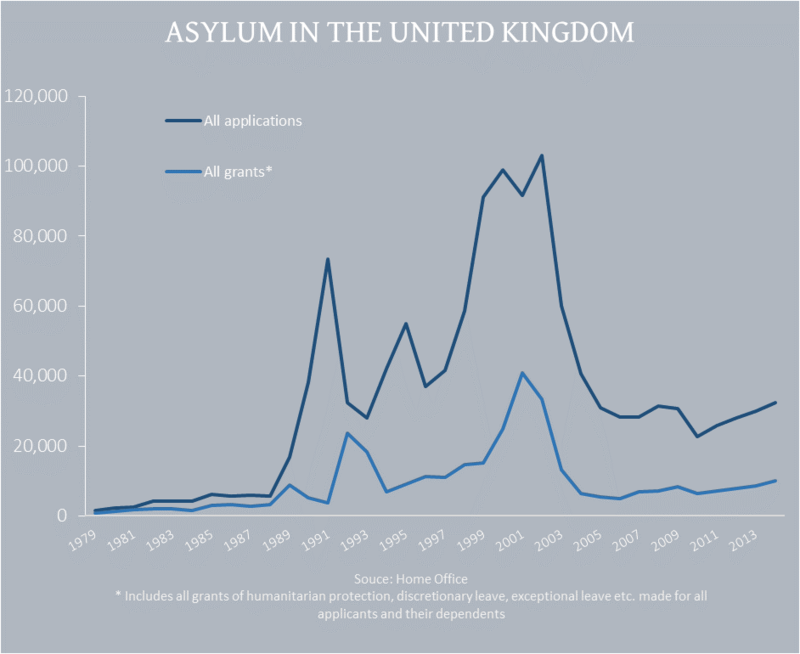 Between 1979 and 2013, there have been just over 340,000 grants of asylum (including grants of humanitarian protection, discretionary leave, exceptional leave to remain) with a yearly average of 9,465. Noticeable peaks occurred in 1992 (23,580) and 2001 (40,780). It is hard to estimate how many people who have had their applications refused who manage to stay on. We do know that of applicants between 2004 and 2014 (not including dependents), 17 per cent were ultimately deported while 8 per cent left voluntarily. Adding these together, along with all grants and cases awaiting a decision, then we are left with a figure of 35 per cent of applicants who have been refused protection but may remain here. In raw numbers, that is 83,194. Asylum seekers have been a significant contribution to UK net migration. Between 1994 and 2003, asylum seekers accounted for between 25 and 54 per cent of net migration. But between 2004 and 2012, the proportion was much lower, ranging from between 4 and 11 per cent of net migration. The government’s Refugee Integration Strategy was launched in 2000 with the aim being to help refugees (but not asylum seekers) begin a new life in the United Kingdom. It aimed to help refugees with access to jobs, housing, education, and language lessons along with encouraging active participation in the community. The Department of Work and Pensions has on top of this, a programme to help refugees enter the labour market. Asylum seekers and refugees are also subject to dispersal whereby the government sends them to live outside of London and the South East. This scheme has been criticised for leaving them isolated and subject to harassment. Analysis of the Survey for New Refugees in the United Kingdom conducted by Cebulla, Daniel, and Zurawan showed that refugees do integrate more with time. Over a period of 21 months, refugees improved their English language skills with the proportion speaking English well rising from 26 per cent to 38 per cent. They also gained greater access to the labour market with 34 per cent employed after 8 months, rising to 49 per cent at 21 months. But much of their skill set initially goes to waste: over one half said they were over-qualified for the jobs they were doing. One third of refugees live in London and tend to stay in the area where they are originally settled. During the 2014/15 refugee crisis, partly triggered by the civil war in Syria, the UK played a smaller role than it had in the Balkan crisis of the 1990s. This was partly because it was harder to reach from Africa and the Middle East and also because it has an opt-out from the the Justice and Home Affairs pillar of the EU. Germany has been a far more powerful magnet for refugees than the UK. In 2014 when asylum claims in the EU as a whole were over 600,000 the UK received 31,000, 5 per cent of the total. This put it in sixth place within the EU but it was below average on a per capita basis. In 2014 the 10 countries from which the most applications came to the UK were: Eritrea (13 per cent), Pakistan (10.9 per cent), Syria (8.4 per cent), Iran (8.1 per cent), Albania (6.3 per cent), Sudan (5.8 per cent), Sri Lanka (5.1 per cent), Afghanistan (4.6 per cent), Nigeria (3.5 per cent), and Bangladesh (3 per cent). Britain is set to get more ethnically diverse with the share of white individuals decreasing. New projections by Phillip Rees of the University of Leeds predict that the share of the white population will decrease from 87.3 per cent in 2011 to 69.7 per cent by 2061. The white population is expected to grow in absolute terms, by around 1.6 million over this time period but that is nothing compared to the expect growth in the non-white ethnic minority population. This is predicted to rise from 8.1 million to 24.7 million in 2061, an increase of 206 per cent. By far the sharpest increase in terms of both population share and in absolute terms will be seen among Asians. The same study projects that Britain’s Asian population will increase from 7 per cent of the population in 2011 to 19 per cent in 2061 – or from 4.3 million to 15.4 million, an increase of 255 per cent. A sharp increase will also be seen among the numbers of mixed-ethnicity individuals although they are starting out from a much lower base (2 per cent in 2011 rising to 5 per cent in 2061). The projection for Britain’s black population will be less steep, rising from 3 per cent to 4 per cent between 2011 and 2061 – or from 1.9 million to 3.7 million, an increase of 94 per cent. Such projections become more prone to error the further you look into the future. Certainly, they do give a strong insight into the demographic trajectories (think birth rates and migration flows) of different ethnic groups as they stand today. In a separate analysis, the Office for National Statistics has projected that the British population will rise from a current estimate of 64.6 million to 74.3 million by 2039. Assumed net migration is predicted to account for 51 per cent of this growth. Immigration into Britain will sustain what would otherwise be a decline in population; given that immigrants tend to be younger, it will not be sufficient to prevent the overall aging of the population. Where do ethnic minorities live? Ethnic minorities are overwhelmingly concentrated in urban areas (95 per cent) and nearly two thirds live in large cities such as London and Birmingham. Looking at the regional residential patterns in England, ethnic minorities are most likely to live in London, with around 4.5 million doing so in 2011. Ethnic minorities comprised 55.1 per cent of the population of London. In 2011 the two regions with the second and third highest numbers of ethnic minorities were the South East (about 1.3 million or 14.8 per cent) and North West (about 900,000 or 12.9 per cent). Although the West Midlands had fewer ethnic minorities than these two regions (1.2 million), the proportion was greater (20.8 per cent). About three-quarters of immigrants live in just one-quarter of council districts, according to the Migration Advisory Committee. Across England, the White British population (total number about 42 million) is more evenly spread than the ethnic minority population, with the South East (7.4 million) and North West (6.1 million) being the most populous regions. The North East has the highest proportion of White British (93.6 per cent). While it is true that minorities are more than likely to be found in London, nevertheless, not all ethnic groups cluster around London in the same manner. For instance, in 2011, 57.3 per cent of Black Caribbeans and 56.2 per cent of Black Africans were found to be living in London, while only 19 per cent of Pakistanis lived there. Pakistanis are much more dispersed around the UK – 16.1 per cent are found in the North West, 19.3 per cent are found in the West Midlands, and 19.2 per cent are in Yorkshire and the Humber. Minorities tend to cluster in urban areas. Around 95 per cent of ethnic minorities in England and Wales can be found in urban areas compared with 78 per cent of the White British. Conversely, about 5 per cent of minorities live in rural areas compared with about 22 per cent of White British. About 62 per cent of the ethnic minority population live in major urban conurbations (such as Birmingham, Manchester and London) compared with 26 per cent of White British. Nearly 60 per cent of non-whites live outside London. Between 2001 and 2011 ethnic minority groups spread out and nowadays are not as rare in rural and provincial areas as they once had been. Apart from London there are now three other towns where the ethnic minority population is greater than the White British one. In Slough the ethnic minority population is 65 per cent, and in Luton and Leicester it is 55 per cent. Other cities, such as Birmingham and Manchester, had small White British majorities in 2011. Birmingham is probably already majority–minority since in 2011 it was roughly evenly split between White British and ethnic minorities. Ethnic minorities are less likely to be homeowners and slightly more likely to live in social housing compared to the White British. According to census data, 65.7 per cent of all residents in England and Wales in 2011 were home owners either outright or with the aid of a mortgage. For the White British this figure was 70 per cent while for ethnic minorities it was 47.8 per cent. Indians and Pakistanis had comparable rates of home ownership to the White British at 72.4 per cent and 69.1 per cent respectively. Ethnic minority groups with relatively low rates of home ownership are Black Africans (25.8 per cent) and White Other (36 per cent); for Bangladeshis the figure is 46.9 per cent and for the Chinese it is 52.9 per cent. The foreign-born population has significantly lower ownership rates; in 2013, 43 per cent were homeowners in contrast with 69 per cent of the UK-born population. There was a decline in the proportion of homeowners between 2001 and 2011, and this has been particularly sharp for ethnic minorities, and is largely because of high immigration. Recent arrivals are much less likely to own homes than ethnic minorities already living in England and Wales and prefer to rent from the private sector, hence a proportional decline. However, with time immigrants gradually gain a foothold and so rates of home ownership come to resemble closely those of the UK born – according to census data from England and Wales, 18 per cent of recently arrived immigrants owned homes compared with 78 per cent of those who have been here more than 30 years and 69 per cent of the UK-born population. There is variation in patterns of ownership by country of origin. For instance, 44 per cent of Bangladeshi immigrants were homeowners compared with 64 per cent of Pakistani immigrants. 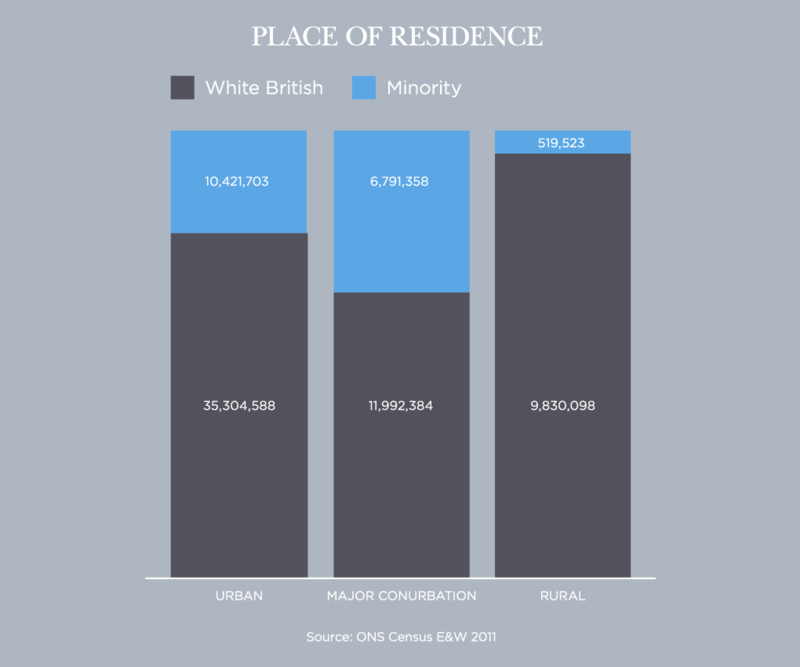 Whilst it is true that the ethnic majority is more likely to own their homes, much of the white British’s greater access to home ownership can be accounted for by other intervening variables. Looking at census microdata (a 5 per cent sample of the 2011 census for England and Wales) we see that the white British are more likely than all other groups to own houses (either outright or with a mortgage). For instance, the odds of a Bangladeshi owning his home are 36 per cent of those of a white British person. Those of a black Caribbean are 39 per cent. But for Indians, there is no difference. Once we control for potentially relevant variables (being an immigrant, age, occupational class, region, English proficiency) then a completely different picture emerges: all Asian groups (including Chinese) are now more likely than the white British to own homes. For Bangladeshis the odds are now 170 per cent greater than those of the white British. This reversal is largely accounted for by the fact that Bangladeshis tend to be clustered in London. Note also that the odds for black Caribbeans are still lesser, only not quite as low – the odds of a black Caribbean owning a home are 70 per cent of those of a white Briton. In 2011, 16.4 per cent of the population of England and Wales were in social housing, 15.6 per cent of White British, and 19.9 per cent of ethnic minorities. Indians had the lowest rate of social housing (5.9 per cent); Chinese people also had a low rate (10.3 per cent), while for White Other it was 10.7 per cent. Black Africans had high rates of social housing (40.9 per cent), and 38 per cent of Black Caribbeans and 34.6 per cent of Bangladeshis lived in social housing. London stands out, however, in that 29.5 per cent of ethnic minorities in the capital resided in social housing in 2011, compared with 19.4 per cent of White British Londoners. The rate of social housing occupancy for the White British diminishes as age increases whereas the reverse can be said for ethnic minorities. 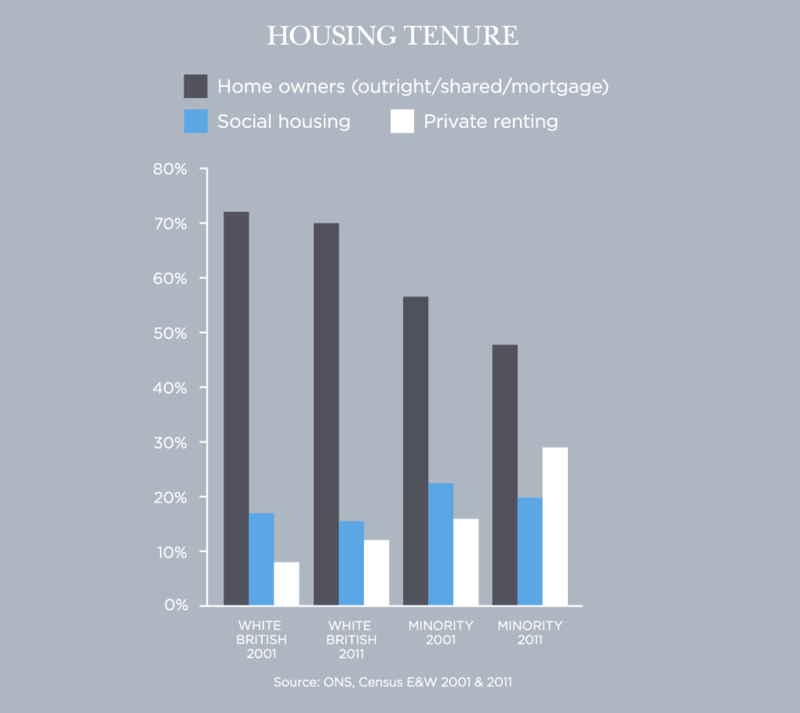 18 per cent of ethnic minority 16-24 year olds rent social housing as opposed to 24 per cent of those older than 55. For the White British this figure goes from 25 per cent of 16-24 year olds to 16 per cent of over 55’s. The most common route into social housing in 2016 was through direct application which accounted for 44 per cent of lettings. However, both the Black Caribbean and Bangladeshi ethnic groups were the least likely to use this route with it making up 32 and 35 per cent of their social housing lettings respectively. 39 per cent of entries into social housing for the Bangladeshi ethnic group were through nomination by the local authority making them the only group with this as the most common route into social housing. In 2013 the Migration Observatory found that UK-born and foreign-born individuals were equally likely to live in social housing: approximately 17 per cent of the UK-born population and 18 per cent of foreign-born individuals were in social housing. Overall, 15.4 per cent in England & Wales were living in accommodation rented from either a private landlord or letting agency. For the White British this figure was 12.1 per cent while for ethnic minorities it was 29 per cent. The highest rate of private letting was found among the White Others – 50 per cent. Rates were also relatively high for Chinese (31.3 per cent) and Black Africans (30 per cent). For Black Caribbeans it was 13.3 per cent, Bangladeshis 15.4 per cent, Pakistanis 15.8 per cent and Indians 19.2 per cent. 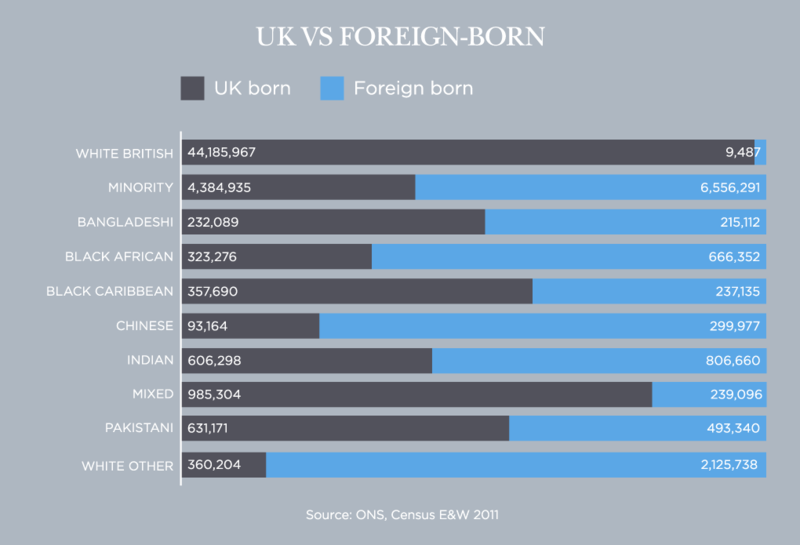 The foreign-born population is almost three times more likely than those born in the UK to rent from a private landlord (38 per cent were in this sector in 2013, compared with only 14 per cent of UK-born). Research by the Joseph Rowntree Foundation found that new migrants were more likely to rent privately and frequently are renting the poorest quality housing. Ethnic minorities are considerably more likely to experience overcrowding than the White British majority. 22 per cent of ethnic minority individuals living in England & Wales experienced overcrowding compared to only 5 per cent of the White British. Most notably, overcrowding was experienced by 41 per cent of Bangladeshis, 32 per cent of Pakistanis, and 32 per cent of Black Africans. The proportions for Indians, Chinese, and Black Caribbeans are much lower at around 15 to 20 per cent. However, more recent evidence suggests that overcrowding figures had fallen. According to the English Housing Survey, overcrowding was experienced by 30 per cent of Bangladeshis, 15 per cent of Pakistanis, and 15 per cent of Black Africans. Indians, Chinese, and Black Caribbeans saw lower proportions at around 8 per cent. The five local authorities with the highest percentage of overcrowded households in 2011 were in London. Newham had the highest level of overcrowding, with a quarter (25.2 per cent) of its households falling into this category. Newham also had the lowest proportion of White British residents of any local authority in the country. In 2011 other areas experiencing exceptionally high levels of overcrowding were Brent with 17.7 per cent of homes being overcrowded, Tower Hamlets (16.4 per cent), Haringey (15.9 per cent) and Waltham Forest (15.4 per cent). Under occupation of households is most likely to occur in White British, White Irish and Indian households. 40, 41 and 29 per cent of these households respectively were under occupied. Black African households (11 per cent) and Arab households (12 per cent) were the least likely to be under occupied. Regionally, under occupation was most likely to occur in the midlands and the East of England and least likely to occur in London and the North East. Statutory homelessness represents the number of households threatened with loss or unable to live in their current accommodation. The total numbers of statutory homeless households decreased from 2006/7 until 2009/10 but has since been on the rise. Over this time frame the numbers fell from 75,000 to a low of 40,000, then climbing back up to 59,000. 33 per cent of these households in 2016/17 are from ethnic minorities. Of this figure, almost half are black (16 per cent of the total), while 9 per cent of all homeless households are Asian. Over the past 40 years ethnic minority Britons have tended to spill out of their original areas of settlement, this has partly been a consequence of simple growth in numbers and partly upward mobility from the inner city to the suburbs. The result has been more mixing between different minority groups but a greater residential divide between minorities as a whole and the White British. So what is the recent story of ethnic movement and mixing? We have visualised census data, which provide the percentage of a given ethnic group at both ward and local authority levels across time, in the following map. We are mainly concerned here with residential proximity or lack of it of people from different ethnic groups. But there is also mixing within households. 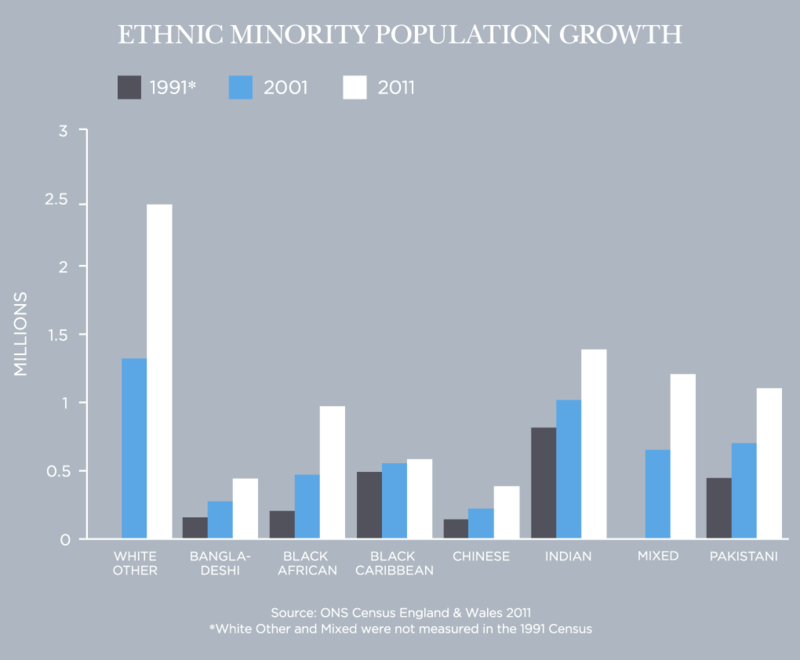 The number of people of mixed ethnicity in England and Wales increased from about 660,000 in 2001 to 1.2 million in 2011 (or from 1 per cent of the total population to just over 2 per cent). In 2011 in households with more than one person, 12 per cent were ethnically mixed compared with 9 per cent in 2001. In London in 2011, 20 per cent of households were ethnically mixed. Clustering usually takes the form of a decreasing White British population (as a percentage of the total population in an area) and sizable minority concentrations. Areas with clustering trends fall into one of two categories: White and one other major ethnic group: Bradford, Burnley and Rochdale (White and Pakistani); or Coventry and Preston (White and Indian); or Tower Hamlets (White and Bangladeshi). White and two other ethnic groups: Blackburn, Birmingham, Huddersfield, Leicester and Derby (White and Indian and Pakistani). 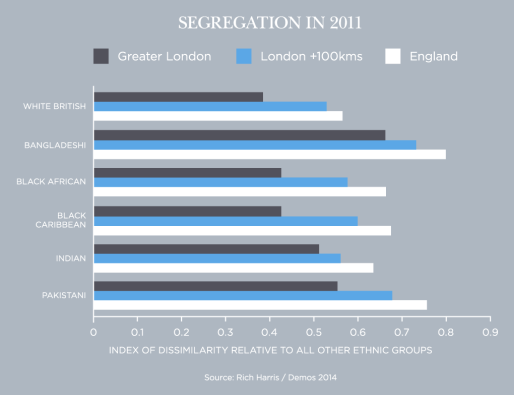 In London, note the way ethnic minorities have begun leaving their historic areas of concentration while White British have either consolidated in traditionally white parts of Outer London such as Bexley and Bromley or moved to central inner London locations such as Hackney or the City of London. Visible minority concentration is mostly in London, the Midlands, or the mill towns (e.g. Tower Hamlets, Oldham, Bradford, Burnley, Birmingham, and Leicester). We can investigate this phenomenon more closely by looking at local authorities in England and Wales (district and unitary) with the largest proportions of each ethnic group in them. The White British population is much larger than the population for other ethnic groups and therefore there are many local authorities that are almost completely white. For instance, Redcar and Cleveland is almost 98 per cent white, as are Allerdale and Staffordshire Moorlands. The White Other group is found in higher concentrations in inner London. The most concentrated areas for Indians tend to be in and around London (yet there are large numbers of Indians in the West Midlands and Yorkshire and The Humber). As we have already noted, Pakistanis are much more common in the north of England while Bangladeshis are clustered in East London, with Tower Hamlets and neighbouring Newham being their most popular residential areas. People of African descent are mostly in London, with Southwark, Barking and Dagenham, and Greenwich the leading residential zones. Black Caribbeans are also concentrated in London. People of Chinese descent are generally more widely dispersed, living mainly in Cambridge and the City of London, as well as Tower Hamlets, Camden and Southwark. Some urban areas have high mobility and a relatively rapid population turnover known as ‘churn’. ‘Escalator churn’, where aspirational residents who become better off move out, and ‘gentrifier churn’, where better off households move in, can occur simultaneously in different parts of one locality. Some areas, especially in big cities, are used to high churn associated with migration or students or both, but people in more settled residential areas can be discomforted if their neighbourhood suddenly becomes a high churn area. In 2009 the equivalent of half of the population of ten out of the 32 London boroughs had moved in or out in the last five years. Even in the boroughs with the most settled populations like Havering and Bexley the equivalent of one-fifth of the population had moved in or out in the last five years. ‘Churn’ of this type happens at a much higher rate at the borough level in London than anywhere else in the country; however, the overall population turnover in inner London is lower than in Birmingham, Leeds and Liverpool. In these towns a quarter of the population moved in or out in the five years preceding 2009, and in Nottingham and Manchester two-fifths of the population moved in or out in the same time period (all of these cities have large student populations). 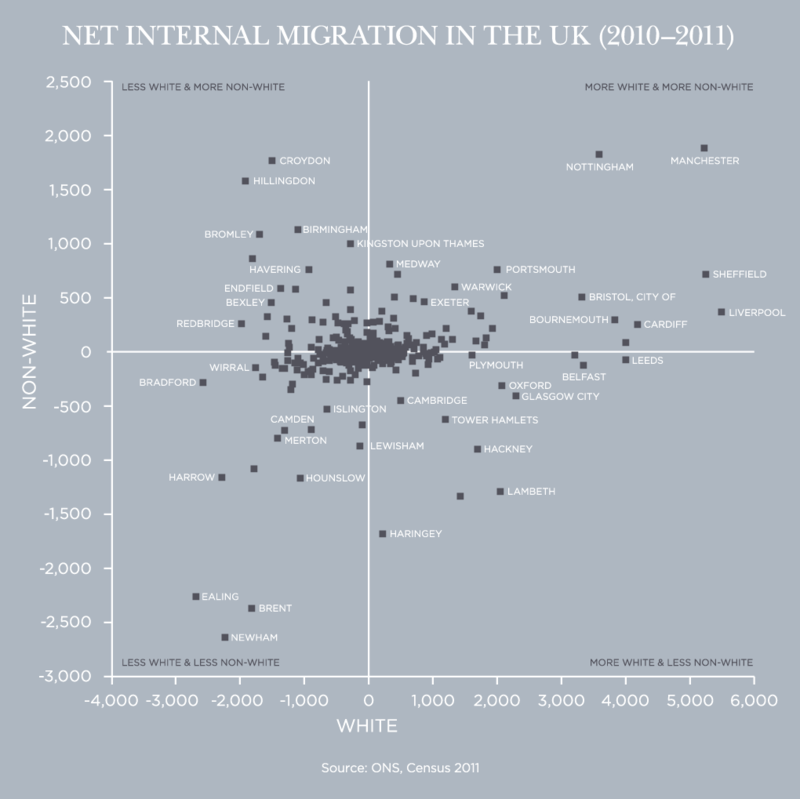 The 2011 census of England and Wales allows us to look at churn by ethnicity in terms of recent internal migration. Those local authorities (district & unitary) which had gained the most non-whites between 2010 and 2011 were Manchester, Nottingham, Croydon, Hillingdon and Birmingham. Losses of non-whites were greatest in the London boroughs of Newham, Brent, Ealing, Haringey and Southwark. Areas that were losing the most white people were: Ealing, Bradford, Harrow, Newham and Redbridge. Where were they going? The places with the greatest net gains of white people were Liverpool, Sheffield, Manchester, Cardiff and Leeds. The graph below shows the net internal migration of white and non-white people at local authority level. The top left quadrant shows all those areas that have gained non-whites but have lost whites and thus are experiencing a change in their ethnic composition. Croydon, Hillingdon, Birmingham and Bromley stand out in this regard. The bottom right quadrant shows the converse – those areas that are losing non-whites but gaining whites and thus experiencing ‘whitening’. Prominent among these are the London boroughs of Tower Hamlets, Hackney, Lambeth, Southwark and Haringey. 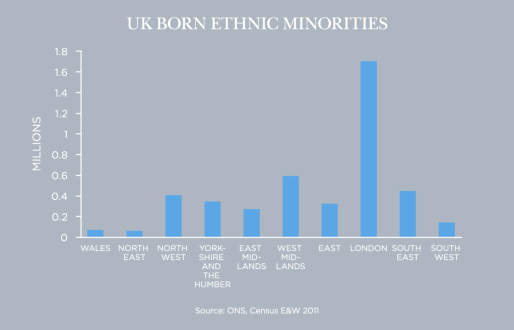 Analysis of the census by Rich Harris shows the White British are much more spread out while ethnic minorities tend to cluster together. Among ethnic minorities, the group with the greatest geographic spread are Black Africans followed closely by Black Caribbeans and then Indians. Spread for Bangladeshis is much lower. Ethnic minority groups are starting to disperse from their historic centres of concentration but at different rates. Between 2001 and 2011, the spread of Black Africans increased by 70 per cent compared to just 16.7 per cent for Black Caribbeans. Pakistanis and Bangladeshis showed surprisingly high rates of dispersal with their respective spreads increasing by 42.9 per cent and 55.6 per cent respectively. For Indians, the increase in spread was least at 35.5 per cent while the White British majority actually contracted, decreasing its spread by 5.3 per cent. You can explore these trends using our Residential Patterns map. Academics study residency patterns by using something called the index of dissimilarity. This measures the spread, or degree of separation, of two groups (for example White British and Bangladeshi British) within an area. More specifically, it shows the percentage of the ethnic group in question that would need to move somewhere else within the wider area in order to achieve the same spread as the comparator group. A maximum score of 1 shows that an ethnic group is completely separate. A minimum of 0 shows there is no residential segregation. The index of dissimilarity is a useful device for giving an overall picture of ethnic mixing trends. The index cannot, however, give a ‘feel’ for an area and the relationships in it; it is possible that an area that has high segregation according to the index may actually have more cross-ethnic contact and friendships than a less segregated one. Such relationships can be explored in our section on social mixing. There is also the possibility that there will be pockets of segregation within what appears on the surface an unsegregated area. Harris found that in 2011 in England Bangladeshis were the most residentially segregated minority, while the least segregated minority were the Chinese. 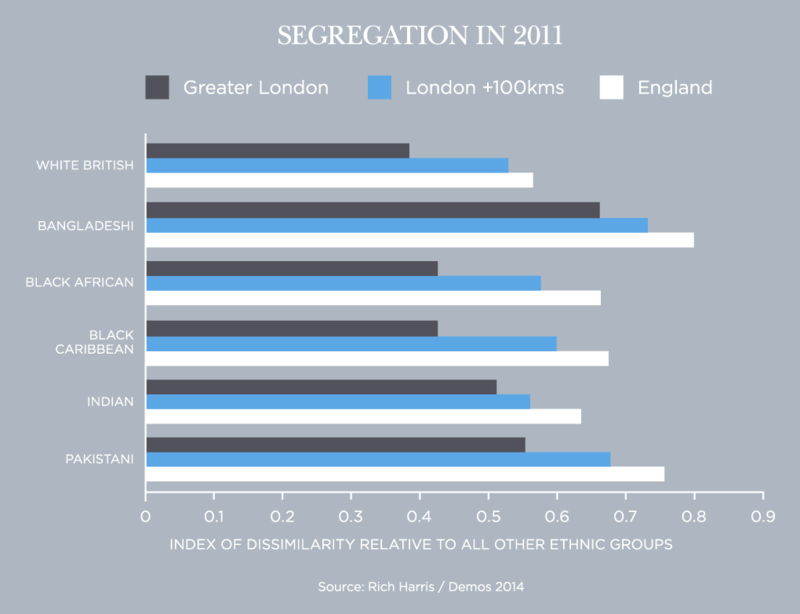 Segregation for all ethnic groups is less pronounced in London. 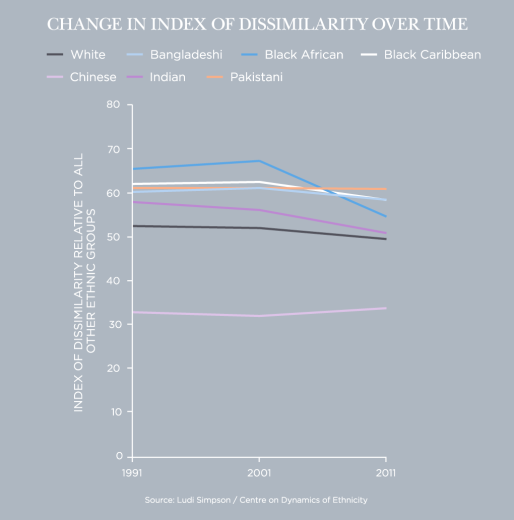 Relatively high readings on the index of dissimilarity were still evident in 2011 for Pakistanis, Bangladeshis, Black Africans and Caribbeans. The one exception to the pattern of decreased segregation are the Chinese, who were slightly more concentrated in 2011 than 2001 with this possibly being attributable to increased numbers of students clustering around university towns. Note that the White British can reduce their segregation from individual minority groups while maintaining segregation from minorities as a whole. This is because minorities may spread out while White British retreat from mixed-minority areas. So the picture is a somewhat paradoxical one of gradually declining segregation combined with greater concentration of minorities in certain areas, thanks to white exit and the growing minority population. In 2011, 4.1 million non-white ethnic minority individuals or 41 per cent of the minority population lived in wards that were less than 50 per cent white, compared with roughly 1 million or 25 per cent who did so in 2001. In 2001, 119 wards out of 8,800 were majority non-white while in 2011, 429 were majority non-white out of 8,570. White areas have become less white while minority areas have not become less minority. Minorities were leaving their areas of ethnic concentration. Minorities prefer to move to diverse areas that are not dominated by either whites or their own ethnic group. White British people tend to avoid highly diverse wards. In London, White British and ethnic minorities are leaving at different rates. In 1971, the White British share of London’s population was 86 per cent. In 2011, it was 45 per cent, down from 58 per cent in 2001. Of London’s 32 boroughs, 23 were majority non-White British. Between 2001 and 2011, Kaufmann and Harris found that around 620,000 White British people left London, most of whom moved to whiter areas; whites left London at three times the rate of minorities (about 100,000 of the latter left London). This was all despite London’s population increasing by approximately 1 million. Most high-minority areas are relatively deprived and densely populated so people from all ethnic groups often seek to leave. Minorities tend to be more likely to stay than whites. In 2001, a fifth of ethnic minority individuals lived in the most diverse areas, where on average 33 per cent of the population was white. In 2011, one-fifth of ethnic minorities lived in the most diverse areas, which are on average 21 per cent white. When whites and minorities leave inner city areas with large shares of ethnic minorities, they are generally replaced by other ethnic minorities either through population increases or by immigration. Reasons for white exit are not, it seems, directly linked to racial attitudes, because liberal and conservative whites are leaving at identical rates. However, amenities, area status, family and friendship networks are correlated with ethnicity. Research suggests that many whites (but not visible ethnic minorities) perceive an area to have lower status if it has a higher share of visible minorities, regardless of the area’s average income or physical amenities. Another possibility is that surveys do not capture unconscious decisions which may in fact be racially directed. Thus white liberals may be making the same ethnic decisions as white conservatives. Further to this, data from the National Travel Survey show non-white minorities are more rooted within their local communities and travelling less. Whites took an average of 955 trips per year, travelling a distance of 6,944 miles over the period from 2011 – 2015. In the same period non-whites travelled an average of 4,386 miles over 784 trips. Black people travelled the furthest for education at 500 miles (11 per cent of all travel) while White people travelled 318 miles in educational trips (5 per cent of all travel). Asians travelled 376 miles (8 per cent of all their travel) for education and those of mixed ethnicity 423 miles (9 per cent of travel). Catney G, ‘Has neighbourhood ethnic segregation decreased? 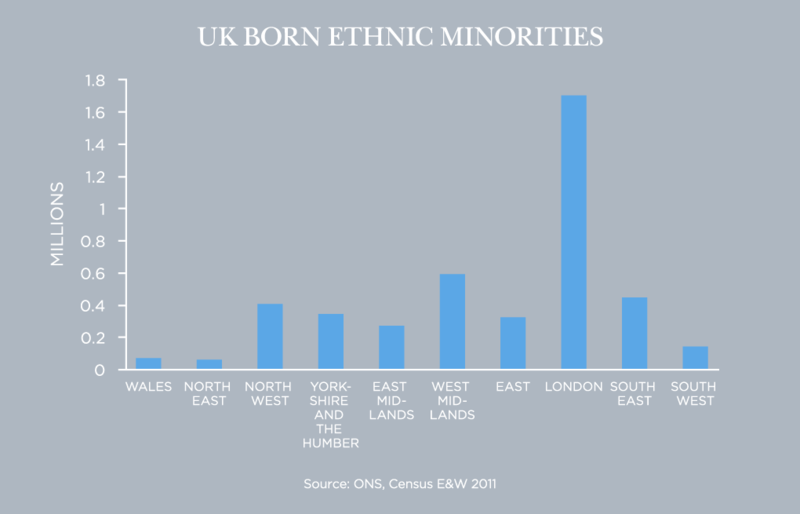 The dynamics of diversity: evidence from the 2011 census briefing’, Manchester: Centre on Dynamics of Ethnicity, 2013. Catney G and Simpson L, ‘Settlement area migration in England & Wales: assessing evidence for a social gradient’, Transactions of the Institute of British Geographers 35, no 4, 2010, pp 571–84. Harris R, ‘Evidence and trends: are we becoming more integrated, more segregated, or both?’ in D Goodhart (ed), Mapping Integration, London: Demos, 2014. Kaufmann E and Harris G, Changing Places: The White British response to ethnic change, London: Demos, 2014. Phillips, T, After 7/7: Sleepwalking to segregation, 2005. 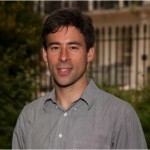 Poulsen M, ‘The new geography of ethnicity in Britain’, presented at Royal Geographic Society Annual Conference, 2005. Simpson L, ‘Ghettos of the mind: the empirical behaviour of indices of segregation and diversity’, Journal of the Royal Statistical Society Series A, Statistics in Society 170, 2007, pp 405–24. Simpson L, ‘More segregation or more mixing?’, The Dynamics of Diversity: evidence from the 2011 Census Briefing, Manchester: Centre on Dynamics of Ethnicity, 2012. www.ethnicity.ac.uk/medialibrary/briefingsupdated/more-segregation-or-more-mixing.pdf. Simpson L and Finney N, ‘Parallel lives and ghettos in Britain: facts or myths?’ Geography 95, 2010, pp 124–31. Social Statistics - a resource for social geography, social economics, and promoting statistical and spatial literacy.